It’s come to our attention that the Ohio State University now features a bacon vending machine. The technology was installed in the Animal Sciences Building at the university’s College of Food, Agricultural, and Environmental Sciences, and it dispenses servings of ready-to-eat bacon for $1 each. These basic facts have led me to ask a lot of questions about what’s really going on. The bacon vending machine is very real, by the way. The Ohio Pork Council is responsible for installing the marvel, and the organization told me in an email that the machine has “been very well received on campus.” But still, my questions. It is. The bacon has been provided by Sugardale Foods, Hormel Foods, and Smithfield Foods. Apparently not. The Ohio Pork Council says that the bacon is ready-to-eat. 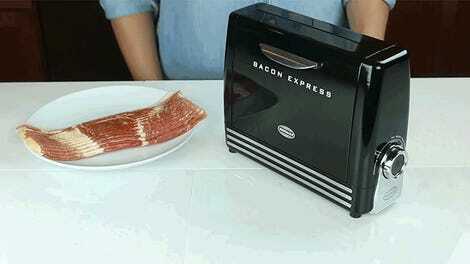 Bacon enthusiasts will know that this is not a revolutionary invention. Pre-cooked bacon has been on the market for quite some time. It’s great on salads, in sandwiches, and as a snack. You can even buy ready-to-eat bacon in bulk on Amazon. 4. How much bacon does $1 buy? More than you might think. For $1, customers can select either a box of 12 bacon slices or a pouch of bacon bits. While the machine was installed by the Ohio Pork Council, all proceeds from the bacon vending machine go directly to the Ohio State Meat Sciences program.